So . . . my wife and I went out today since the kids were with their grandmother. In the process we forgot our mobile phones. We BOTH forgot our phones. 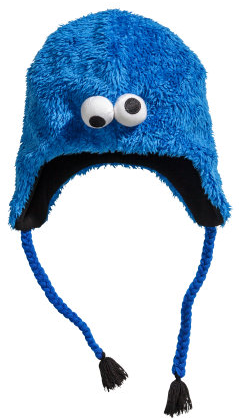 Instagram/Tumblr – We were in H&M and I spied a Cookie Monster beanie in the mens’ section. I would normally have taken a shot of such a magnificent thing but again, I was without my mobile phone. SMS – As I was trying on clothes at H&M, I noticed a small sign in the changing room letting me know that if I were to text, 63354 to 74126, I would get 10% off on my entire order. But alas . . .
“the phone/clock” – My mom was supposed to drop them off early in the afternoon but we had no idea what time since we didn’t have the phone nor a watch. For those of you that don’t want to be a slave to your phone: get a grip. I/we aren’t slaves. We were fine. We simply weren’t able to share our experience as we normally would have. Don’t think of the device as an anchor but more of a Swiss Army knife. Would you go camping without one of those? The mobile phone. The tool for the urban wilderness.